We get it. Some people would rather try to take care of a problem themselves before seeking a specialist. A few are inclined to wait until their foot is practically falling off before scheduling an appointment! But trust us on this one. 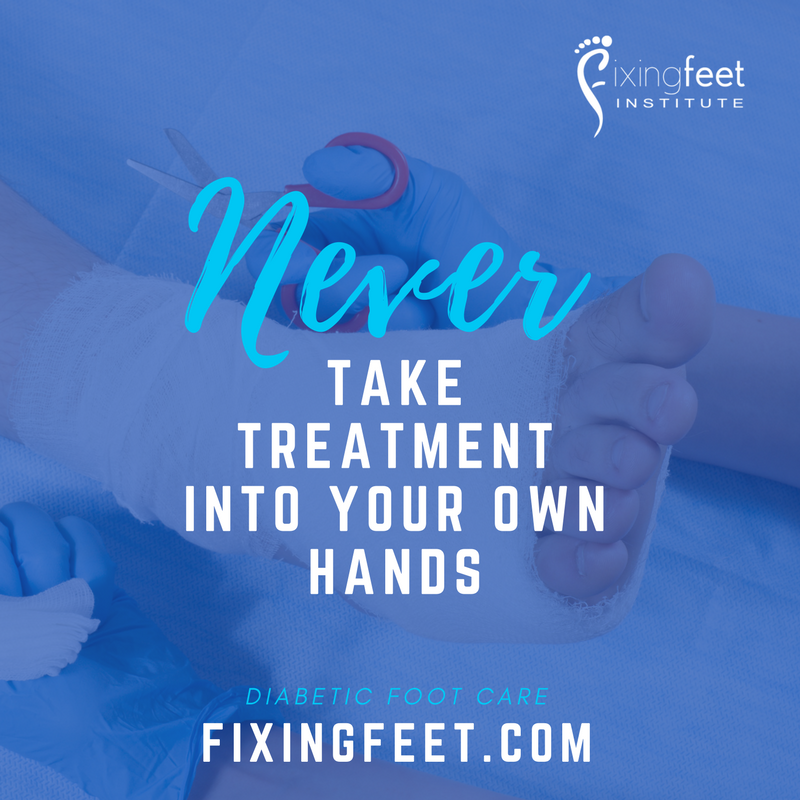 If you have diabetes, neuropathy, peripheral artery disease, or ANY condition that could influence the health of your nerves, your circulation, or your immune system, NEVER take treatment into your own hands for a cut or sore on your foot. The consequences can be particularly dire. Even in healthy individuals, feet don’t get a lot of blood flow relative to other parts of your body, and that can make healing a slower-than-usual process. For those whose circulation or immunity have been compromised, however, the situation is much worse. One little cut is often all it takes. Your body can’t fight off microscopic invaders or close the wound fast enough to prevent an infection. And that infection can spread and deepen, killing tissue and even reaching the bone. Ultimately, an amputation might be the only way to stop the infection from reaching further and further—or even killing you. If you spot a sore or cut on your feet, don’t take any chances. Give the Fixing Feet Institute in Surprise, AZ a call and we’ll help you set up an appointment as soon as possible. We’ll get you into the office, assess your situation, and determine whatever follow-up care is needed. Serious sores or ulcers will need a rigorous wound care treatment in order to prevent or reverse an infection, and ultimately allow you to protect your feet, your mobility, and your personal independence. Prevention is equally important, too. Foot sores are usually preventable, and developing one is an indication that you may need to take some additional steps to protect yourself. This is also an important component of the care that we offer at the Fixing Feet Institute. We’ll help you make sure you get the right footwear (including prescription diabetic shoes or custom orthotics, if necessary) and all the instruction and training you might need to perform daily diabetic foot checks at home. It bears repeating—don’t try to take on a foot sore or cut on your own! When the potential cost is the loss of a limb (or a life), it’s just not worth the risk. You can reach our office in Surprise, AZ by calling (623) 584-5556 today.